East Coast weather is freakishly warm this Christmas Eve. This year, Christmas Eve feels more like the tropics for much of the East Coast. 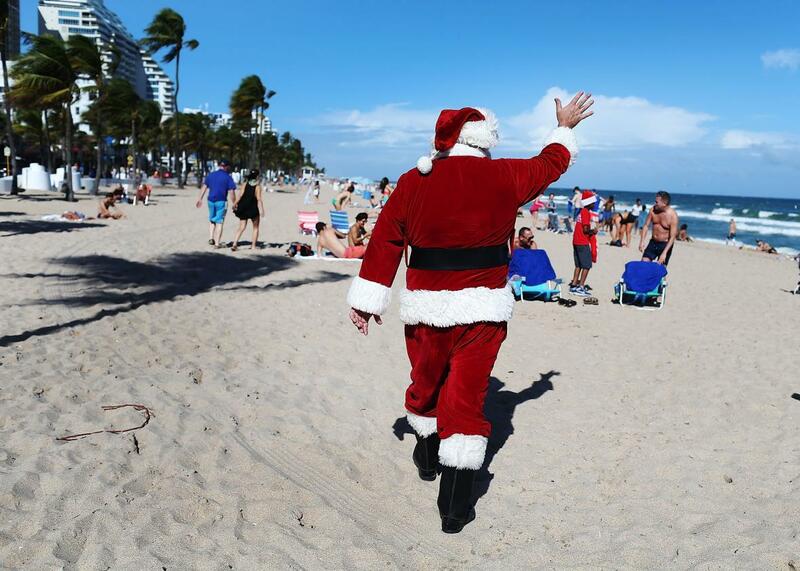 Here, Timmy McGovern dressed as Santa Claus walks along the beach passing out candy canes and posing for pictures with beach-goers on Dec. 21, 2015 in Fort Lauderdale, Florida. As a journalist, I know you’re not supposed to personify inanimate objects, but the weather in America this week seems angry. Take Wednesday, for example. As travelers rushed home to celebrate the holidays, temperatures in New England soared to spring-like levels. Street vendors dismantled Christmas-tree stands in New York City in the driving rain. Tornadoes tore through the South. On Lake Michigan, wind gusts approached hurricane force. And the data backs up what we already intuitively know: None of us, or any of our grandparents, ever experienced a December with weather like this. All month long, temperatures have been so unseasonably warm up and down the East Coast that it’s broken the National Weather Service’s anomaly scale. December 2015 is on pace to become one of the most anomalous months—hot or cold—ever measured in the United States. Philadelphia, for example, will simply shatter its monthly temperature record. For New England in particular, this comes as quite a shock. It wasn’t too many months ago that Boston was digging out of record-setting snow and suffering bone-chilling cold. On Thursday, Boston’s 70-degree weather will be warmer than Phoenix (64 degrees), and more typical of Orlando this time of year. This morning’s low temperature in Burlington, Vermont—nearly 40 degrees above normal—will tie its previous record high for the date should it hold until midnight. Burlington is set to hit 62 degrees, 11 degrees warmer than its previous daily record—about the same as a typical Christmas Eve in Charlotte, North Carolina. Thunderstorms could stretch as far north as southern Maine. “It is safe to say Santa could wear Bermuda shorts this year,” wrote Stacie Hanes, a forecaster at the National Weather Service office serving Portland, Maine. Virtually every city east of a New Orleans-to-Chicago line will set temperature records on Christmas Eve. Temperatures on Thursday will be 35 to 45 degrees warmer than normal for the date across most of the East, producing weather more typical of May or June than late December. Florida will be downright summery, with record temperatures nearing the 90s. The genuinely muggy late-December weather is rewriting the seasons. This year’s July 4 high temperature in New York City was 75 degrees. Christmas Eve’s forecasted high? 75 degrees. That’s so far into “weird” territory that you’d be forgiven if you wake up thinking Santa teleported the whole region to the tropics. Actually, that’s not so far from what’s happening. The weather pattern, which many meteorologists are referring to as a “blowtorch,” has been taking shape for several days as steady westward winds have been blowing low over the tropical Atlantic, scooping up loads of moisture. And there’s definitely a lot of moisture to work with: Much of the tropical Atlantic Ocean has been record-warm in 2015, and warmer water means more evaporation. A particularly intense midwestern storm system brewing since Monday has steered that truly tropical air mass directly toward the East Coast, and it’s arrived essentially unimpeded, thanks to a stronger-than-normal Arctic circulation that’s keeping cold air firmly sequestered near the North Pole. The NWS weather balloon launched last night over Washington, D.C. measured the most moisture-laden atmosphere ever recorded for any date between December and April. A reverse trajectory model from the National Weather Service traces Christmas Eve’s balmy weather in New York City back to the tropical Atlantic Ocean. A severe weather outbreak on Wednesday, aided by the extreme moisture, spawned reports of 22 tornadoes in five states. The worst tornado hit Holly Springs, Mississippi with radar-estimated winds as strong as 200 mph. The town of Santa Claus, Indiana was also briefly under a tornado warning Wednesday night. December tornado outbreaks along the Gulf Coast aren’t exactly rare—there was a very similar one just last year—but tornadoes as dangerous as the one that hit Holly Springs thankfully are. Since 1950, there’s been only one other tornado to carve a path longer than 100 miles anywhere in the United States in the month of December. Wednesday night’s storms were part of the same weather system that will bring the East its record-breaking warmth on Thursday. The warm weather will stick around, too: High temperatures will be in 60s or 70s in Washington, D.C. until at least Sunday. It’s tempting to blame climate change for all of this—the New York Times even riffed on the tortured emotions New Yorkers are feeling as they shop for gifts in shorts. Sasha Koren, an editor at the Guardian, wrote on Twitter that Wednesday’s weather in New York City felt like “sensory jet lag.” And it’s true: Heat waves like this one have among the clearest ties to global warming of any extreme weather event. Next week, New York City will lock in its longest-ever stretch of days above freezing. The seasons are perceptibly shifting. However, that doesn’t mean greenhouse gases are entirely, or even mostly, to blame for 40-degrees-warmer-than-normal days. This month’s weird warmth is more closely tied to the record-setting El Niño, which has shifted weather patterns and boosted temperatures worldwide. Recent studies suggest, though, that extreme El Niños like this one may be getting more common with climate change. With November’s data in, NASA scientists are now 99.999 percent sure that 2015 will be the warmest year ever recorded. Since El Niño has a delayed effect on the atmosphere, 2016 will almost assuredly be even warmer.